When words cut like a knife! It’s been a week since the Billionaire Security show aired on CNBC. It was re-aired last night and I watched it again to see if I missed anything in the 30 minute show that was about 20 minutes in commercials. That statement by Dan Clark was no less damaging as it was a week ago, yet listening to it again brought up a prevailing issue. 5 to 10 second sound bites last a lifetime. In fact, regardless of whether it was Dan or not, WE all have to defend ourselves in lieu of the affect it can have at a later date. 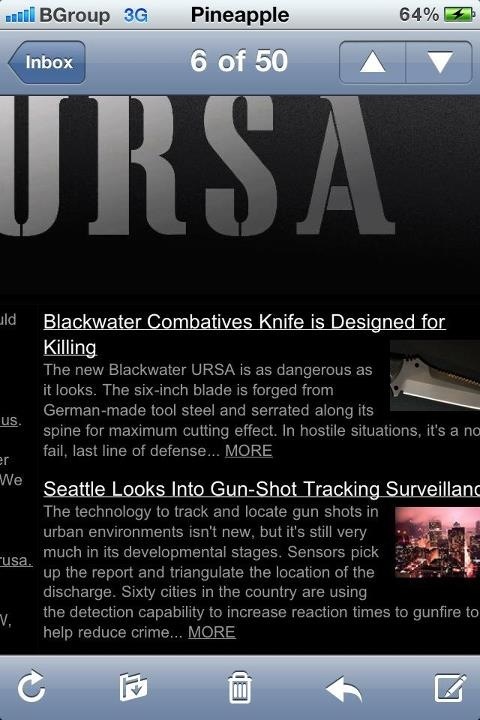 Earlier this month I posted a pic that I received in the Blackwater Tactical monthly issue where they were advertising a new knife called the Ursa-6 your trusted weapon “In Extremis”. As I clicked the link in curiosity I read the tag-line of the knife and my eyes popped wide open. 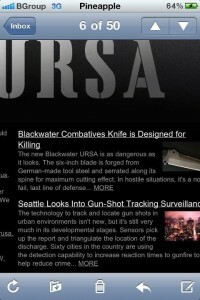 You can read it for yourself but it says, “Blackwater combatives knife is designed for KILLING”. As soon as I read that I knew that they had left themselves and anyone who has a BW knife wide open for problems. Even if the knife was made for the sole purpose of doing that, you cannot say that. Knives have multiple uses, to include be used as a defensive weapon and tool. But to say that it was DESIGNED for killing is a non-defensible position in court. “Isn’t it true that this knife is advertised for killing?” “Was it not the only reason you purchased this knife over any other knife because of it’s intended purpose-to KILL.” How do you defend that by buying that Ursa-6 over the other thousands of knives that are out there. This one specifically is designed for Killing. That is the draw of the advertisement. When you click on the link in the Blackwater Newsletter the first paragraph speaks to a hand-to-hand altercation between a Team of SEALs and some Pirates where a pirate was killed by a SEAL using a knife. That’s the hook for the sale. They use the exploits of the SEALs to draw you in the, “I have to have this knife so I can be just like the SEALs.” That’s outright WRONG, but who am I. I am only one guy that sees that the words we say are resounding and everlasting. Every soundbite, sentence and statement we make looms in the horror of the shade awaiting its return to bite us in the @$$. It is apparent that many people get way over their skis when they are trying to make money and/or make themselves look more important than they are. Be careful with what you say, and who/what you invest in. Absolutely right. God forbid, should any circumstance occur where lethal force is warranted, any good lawyer will use that sound bite against him. We must always be mindful of what we say, what we do and how we represent ourselves, clients and our industry.